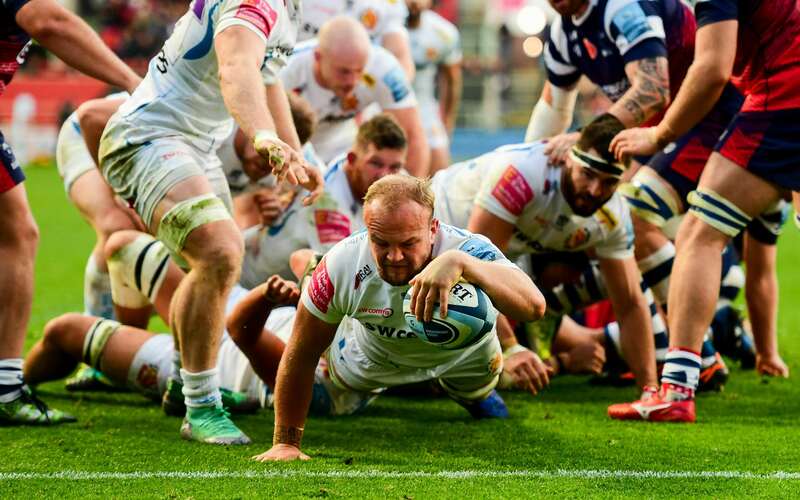 When Exeter Chiefs defeated Bristol eight years ago, it signalled the start of a new dawn for the Devon club. 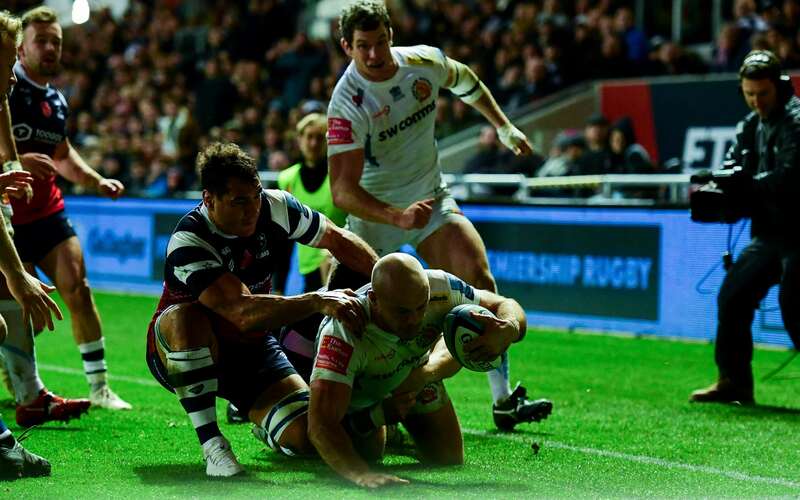 Pitting themselves against English Rugby’s elite for the first time, there were many who predicted Rob Baxter’s side would be cannon-fodder in the heat of the Premiership - and that there stay at the top table would be nothing more than a one-season snack break. Well, fast forward to modern day and those same Chiefs are still causing heartache for their nearest and dearest, but at the same time they are also a much different animal to that of 2010. Bristol - now under the marketers guise of the Bears - put up a decent fight in this hotly-contested derby, even threatening to cause a bit of an upset, but it was the never-say-die attitude of the visitors which prevailed in a controversial conclusion. A penalty try with the clock deep into the red not only ensured the Chiefs made it ‘seven from seven’ in this season’s Premiership, but it delivered a knock-out blow to the Bears, who had earlier claimed tries through Charles Piutau and Luke Morahan, as well as 19 points from the boot of Callum Sheedy. The Chiefs countered with five tries of their own, the most important one being the one awarded by referee Greg MacDonald with the last play of the match.Before then, Moray Low, Tom Lawday, Santi Cordero and skipper Jack Yeandle had all found their way over the try-line for the visitors. Having rested a large nucleus of his frontline stars during the recent Premiership Rugby Cup block, Baxter recalled a powerful Chiefs line-up as the Devonians looked to maintain their unblemished start to the new season in the top-flight. Bristol, meanwhile, were able to parade their star signing Piutau for the first time in league battle, along with Aly Muldowney - one of four former Exeter players named in the home ranks. It was, however, Bears fly-half Sheedy who made the first meaningful impact on proceedings, the Bristol playmaker slotting his side in front with a penalty after just five minutes. Home joy would prove short-lived as the Chiefs hit back almost immediately with their first foray into the Bears territory. A messy Exeter line-out was mopped up nicely by Lawday, whose powerful leg drive allowed him to make yards before offloading to Greg Holmes. Still with plenty to do, the Aussie international drove for the line, only to be repelled by former All Blacks flanker Steven Luatua just inches out.The Chiefs cavalry was soon on the scene, however, and after a couple of close-range pick-and-go drives, it was Low who burrowed his way over the whitewash for the converted score. Sheedy countered with a second successful penalty when Don Armand was harshly called out for not supporting his weight when halting the lively Luatua - and the Bristol No.10 repeated the feat two more times before the half-hour mark as the Chiefs continued to fall foul of referee MacDonald. That said, the Chiefs were never far from the action and when they declined a kickable chance of their own just moments later in search of greater reward, they seized their moment to strike with a second try of the afternoon. Yeandle delivered the line-out, the drive went on and as the two packs combined, it was Lawday who squirmed his way through the heart of the maul to touchdown unopposed.The officials were unsure just how the Exeter No.8 had ended up in that position, but subsequent TV checks ruled in favour of the visitors. Back on level terms as half time approached, it was Bristol who delivered a telling blow just before the interval. Piutau the man to provide the spark, his quick-thinking from a tap penalty just five metres out saw him catch the Chiefs napping and he was able to power his way over for the score, converted by Sheedy. Even then the Bears weren’t finished, the hosts threatened again with a series of powerful surges. Andy Uren and Sheedy were directing operations for the home side, but the Chiefs dug deep into their defensive reserves to not only hold them at bay, but win a crucial penalty that enabled them to clear their lines. Keen to restore parity before the break, Ian Whitten led an Exeter counter at a rate of knots, but as Baxter’s side attempted to work the ball wide, their passing went awry and the threat was averted. After such an exciting conclusion to the first period, it didn’t take long for the second half to live up to a similar billing.Just six minutes had elapsed when the Bears, roared on by a vociferous home support, grabbed their second try of the contest. An initial snipe from Uren signalled the first sign of concern for the visitors, but when Bristol worked their way through the phases, driving ever closer to the Exeter try-line, it was the soft hands of prop John Afoa that created the opening for Morahan to squeeze over in the right-hand corner. Two converted scores behind, Baxter turned to his bench, bringing on the vastly experienced Australian pairing of Nic White and Dave Dennis to help give them some much-needed zest in all departments. It was White’s first outing since the opening day of the season, the scrum-half sidelined with a broken bone in his foot, but it was his energy that helped ignite a revival from the Chiefs, who claimed their third try on 53 minutes. Having helped to lead the raid down the left with compatriots Lees and Dennis, the Chiefs worked the ball across the field at pace through their back division to Devoto, whose pass right found Steenson. Still with much to do, the Argentinian stepped inside, producing footwork more akin to Strictly than English Rugby’s top division, to power his way over the line for a score, converted by the boot of Steenson. Back within seven, the Chiefs were starting to build up a head of steam as the game clicked into the final quarter.However, Bristol were far from done and they had the chance to extend their lead to two scores when Sheedy was afforded another shot at the target.Having been pin-point with his goal kicking all game, his latest effort had the direction, but not enough juice in the tank, as it cannoned back off the crossbar. The chasing O’Conor came within a whisker of latching onto the rebound, but he knocked on and the Chiefs, together with the Travelling Tribe, were able to breath a huge sigh of relief. Not only did Baxter’s side stave off that threat, but they proceeded to work their way back down field and into the Bears half.A needlessly conceded penalty from the home side allowed Steenson to punt the ball back to within five metres of their own line. As the two packs lined-up for the resultant set-piece, clever work at the front involving Armand saw him ship the ball back to Yeandle who, despite the best efforts of two Bristol defenders trying to push him into touch, bulldozed his way over for the bonus point score.Steenson did his best with a testing touchline conversion to level the match up, but his kick drifted wide of the near post, much to the delight of the natives. Up against it, Exeter’s cause would get no easier when Sheedy bagged his fifth penalty with four minutes remaining to put the Bears five clear. Now in the ‘Last Chance Saloon’ - the Chiefs knew they had to gamble if they were to salvage something special.They went left, they went right.They even took the direct route down the middle, eventually forcing a penalty out of the Bears. Steenson drilled the ball to the right corner, creating the platform for one of those tried-and-trusted Chiefs drives from five metres out. Armand collected at the tail, his fellow forwards - aided by a number of backs - applied the drive. Bristol did their best to repel the threat, but when it was crudely brought down in full flow, referee MacDonald had little option but to go under the sticks for the penalty try. A crescendo of boos rang out from all four corners of Ashton Gate, disgusted at the late drama, but for the Chiefs and their army of supporters, victory was assured, as was their place on the summit of the Premiership. Bristol Bears: C Piutau (S Bedlow 66); L Morahan, P O’Conor, W Hurrell, R Edwards; C Sheedy, A Uren; Y Thomas (J Woolmore 70), S Malton (T Lindsay 69), J Afoa; E Holmes, A Muldowney; S Luatua (capt, G Smith 44), D Thomas, N Haining (J Joyce 70). Replacements (not used): L Thiede, H Randall, T Eden. Exeter Chiefs: P Dollman; S Cordero, I Whitten, O Devoto, A Cuthbert (S Hill 60); G Steenson, S Townsend (N White 48); M Low (B Keast 66), J Yeandle (capt, E Taione 71), G Holmes (M Street 66); O Atkins (D Dennis 48), M Lees (W Van Der Sluys 60); D Armand, M Kvesic, T Lawday. Replacement (not used): J Simmonds.